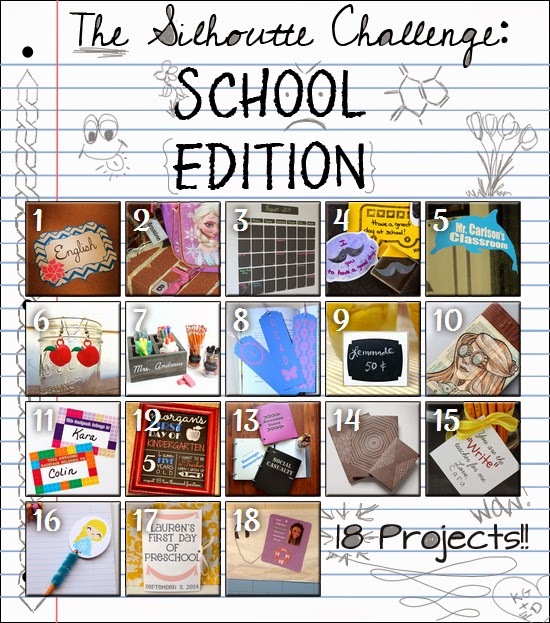 This week is the August Silhouette Challenge. I decided to make a personalized sign for a special teacher. My brother teaches First Grade in a local school. Teaching children is something I have in common with my brother. Did you know that I have an Early Childhood Degree? The theme for this month is" School". After I pondered this project, I settled on giving my brother label stickers. I called him to find out the size, and shape that would fit his needs. By the time we finished brainstorming together, we decided a classroom sign would be even better. He added, before he hung up that the school colors are blue & white, and the mascot is a dolphin. I new this shape would work after I tweaked it a little bit. I deleted additional layers from my file. Leaving the large Dolphin. I enlarged the size to H 8.984" by W 10.567" to make the sign. I use trial and error to find the right size, type, and font that I liked. For a First Grade classroom capitals, and small letters, is part of their curriculum. I made sure the font I used had both, to flow with the level of learning. 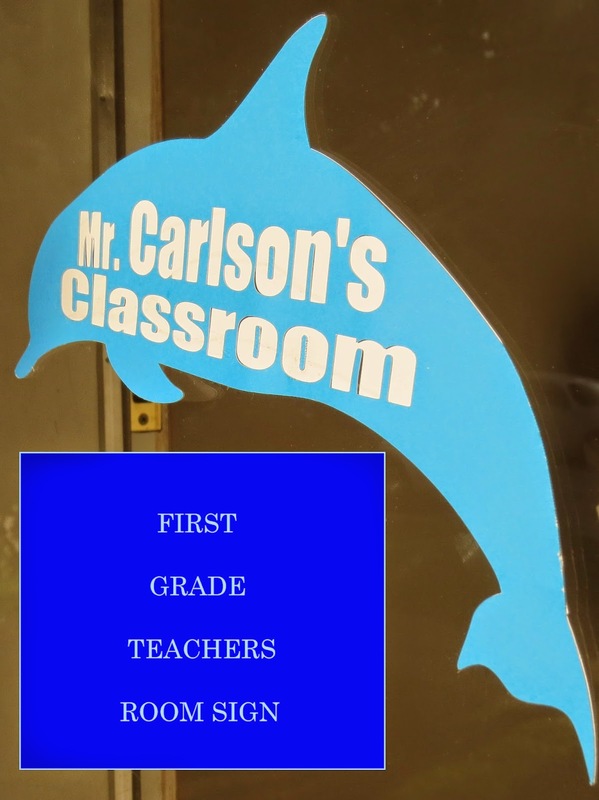 Then reversed the words Mr. Carlson's Classroom. Today I made the project in two layers of cardstock. In the future, I would like to use vinyl for his classroom. But since it is still summer break, I would not be able to show you the sign, or the process. When the school is open I will post a few updated pictures on Facebook Dragonfly & lily Pads. Please fly by, hit like, and notification. You will get to see what I am planning, as well as other blogs I follow and DIY projects too. I used the blade setting 4 and cardstock. I cut the first layer (blue cardstock) which included the lettering cuts. The second layer (white cardstock) I copied, pasted the base layer of the dolphin to insure the size matched perfectly, and then cut the outline. * I included the vinyl settings in the picture in case you would like to use the vinyl material instead of cardstock. * To adhere cardstock to window I would use repositionable adhesive spray. May your school year be filled with the joy of friendship, the excitement of learning, and the success of achievement. Another first is my guest post is going live at this moment. I am so excited to be substitute teaching at Silhouette School. Silhouette School, is a great resource for all of you who own a +Silhouette America cutting machine. Each month my friends from the Silhouette Challenge work hard. to bring together a wealth of projects for you to be inspired. Please click on the pictures below, to enjoy what they we have created, for you today. original post on Dragonfly & Lily Pads. I bet your brother just loved the sign you made for him. I never though about using repositional spray adhesive to attach cardstock to glass. I wonder if it will come off easily? I can imagine making fun things to put on my children's windows. Thanks for sharing! Such a perfect, and personalized gift for your brother!! I love that you incorporated the mascot and colors! P.S. Congrats on the new domain!! This is great! I can't wait to see the update when you can. Thank you for visiting today. I have used it before, and it works well. It can be cleaned off the window when wish. I will use vinyl for a long term effect. You are so nice to hear from and I love your great questions. Thank you Trisha for checking out the blog today. You are so sweet to congratulate me on the new domain. My brother has not seen it yet so I am excited to present him with howI included the Mascot. Thanks so much for visiting today. The update should be soon since he will be setting up his classroom this week. Your kind words are appreciated. It looks so good! I love that you made this for your brother! It is so great to see all that the silhouette can do! I have one but yet to really dive into all the options and I can't wait to check out your post as a substitute! Thank you so much for visiting today. I would love to see what project you start with you silhouette. Please come back and visit. Your note made me smile. The kids will love seeing this! Thank you for Linking Up at PDE Linky Party. Thank you for the Feature on Facebook today. Your kindness is deeply appreciated. Thanks for your sweet words Outlaw! What a fun project to make for your brother! Using the school colors and mascot makes it perfect and the kids will love it. You always make me smile when you leave a personal note of encouragement. I love my Silhouette and I don' know why I waited so long to buy it! Great project. Visiting (and Pinning) from Project Pin It. Thank you for coming by to visit. Your kind comments are appreciated. Come back again soon.